I hope this letter finds you well. I still cannot believe that you have left! How exciting to be headed to America! Are you very glad that you will finally be rid of the Lisle family? You must be tired of working for them. How are they treating you on the ship? AMERICA! How thrilling! What are your plans once you get there? Where will you live? How will you make a living? This must be so scary for you, but also very exciting. I am, at the same time, jealous of you, and glad I am not in your shoes. Does that make sense? You must tell me about the Titanic as well. Is it as marvelous as everyone says? I hear it is unsinkable! What are your rooms like? How is the food? Have you met anyone famous? What about boys? There have to be some interesting young men, possibly even rich, handsome young men that have caught your eye. You simply must tell me every detail! Things are not going to be the same here without you. I already miss you terribly! Who knows, perhaps some day I'll save up enough money to come see you. Please start writing me immediately! I cannot wait to hear about your fascinating adventure. How kind of you to write! I stole a few moments away from my duties to read this on the steerage deck; we may be lower down than the first-class passengers, but the sea air is just as fresh here, and the sky just as blue. Every time I look at the horizon ahead I imagine I can see America. Scary though it is to think of starting over in a new country, I'm excited to finally gain my independence. I hope to get work as a seamstress or perhaps again in service. No, I don't want to be a ladies' maid forever, but it's honest work and I'm good at it. If a few more years in service is what it takes for me to begin my life in America, then so be it. The Lisles -- well, nothing new there. Lady Regina's a beast, Layton's a drunkard, and Irene's as sweet and as helpless as ever. Honestly, I pity the girl. At least I can get rid of Layton and Lady Regina once the Titanic reaches New York City. Irene's stuck with them for life! Honestly, if I thought she could make a living at any trade whatsoever, I might ask Irene if she didn't want to run away too. But then we'd have Lady Regina pursuing us to the ends of the earth. The Titanic is a palace, no other word for it. I had no idea a ship could be so enormous or so beautiful. Lady Regina's such a cheapskate that she's stowed all us servants down in third class, but even that is clean and bright. Better by far than the attic I had to sleep in before. I have three roommates, all of them foreigners, and before this trip, I would have found that terrifying. But two of them are elderly Norwegian ladies without a word of English between them, quiet as mice; the other, Myriam, is from Lebanon -- she's got a sharp tongue but a good heart, and I think we may remain friends after we reach New York. I've met no one famous, though I did get a look at John Jacob Astor. Yes, the richest man in the world was not five feet from me! He's as old as the Viscount, but his wife is my age if not younger. I suppose being so wealthy makes all those lines around his eyes disappear. And now I've gone and told you his name. Letting my imagination run away with me. You know I try not to do that! So rest assured, Andye, that I'm still the same practical girl you've always known. 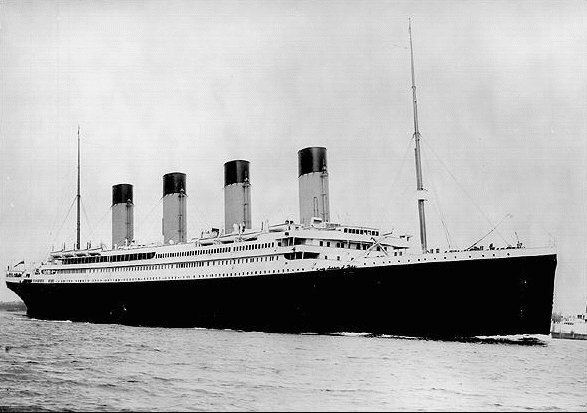 I'm sailing ahead toward my future life as steady and sure as the Titanic herself. The ship's not the only one that's unsinkable! You can find Claudia at these other blog tour stops! I've seen the cover but didn't know anything about this book. Can't wait to read it now. This is the first time I've visited your blog, and I aboslultey love it! Great interview, and great blog. Keep up the awesome work. This is such an interesting topic for a YA book! Great letters! Thank you for sharing! Aww man, I wish she was coming to AZ!! Can't wait to read this one. Thanks! Wow, this book sounds sooooooooooo good!!! I love historic novels as well as novels written with letters. I get more and more excited about this book with each review and teaser I find. So excited for Tuesday!! Thanks for the giveaway! It's such a cool idea to combine paranormal and the Titanic! I love Claudia Gray's Evernight series(I still need to read the last book)! I can't wait to read Fate! This looks like such a great book!!! I really want to read this one. The Titanic AND werewolves? Sounds like a great read. This book sounds awesome! Never read a book about Titanic. Great post. Thanks for the chance to win this! I haven't seen this book before. Thanks for the giveaway! I love these letters! They make me want to read the book even more! I can't wait to read this. Thank you so much for the giveaway! Sounds really good. Im looking forward to reading this one. Oh, my! This book sounds AMAZING! I am all but DYING over here now! I MUST read it! Thank you so much for the giveaway! I'm so anxious for this release. I really enjoyed Claudia's other novels. amazing post! Thanks for the chance to win. I cannot wait for this book, it seems like so much fun to read. Are those actual letters from the ship?? I don't know, but they seem so... normal. Too easy to read for that time period. Haha. If they are, I'm presuming that is where the idea for the book came from? too bad its only for US again :( i am dying to read this since... forever!!! I can't wait to read this book!! It sounds amazing!! Oh awesome! Even though I just preordered it I would still love to win a copy! This sounds like an amazing book!! This book sounds awesome!! I love reading books about the Titanic. Thanks so much for the giveaway! This book looks soooo interesting! Love the storyline idea. THANKS for the giveaway! Wow this sopunds like a great book! I can't wait to get my hands on it!! loved the letters and can't wait to read this book. This sounds to good. Thanks for the chance to win! I've been wanting to read this book for a while now. Thanks for the giveaway! This one sounds really good. Thanks for the chance to win. i love the letters and i can't wait for this book! I can't wait to read Fateful. Finally something that sounds fresh in the YA genre. this book sounds amazing! i love claudia gray and with the titanic background it just screams a fantastic story! I can't wait to read. Nice contest! I love all things Titanic. When I was younger I had a bit of an obsession with it... Thanks for the giveaway!! Thanks for the giveaway! I love all things Titanic so I downloaded the "sample" to my Kindle so I could check it out. Oh, I sooooo want to read this!! Count me in! Oh my gosh, this looks fantastic! My favourite movie is Titanic, and this looks like the love story with a great twist. I love Claudia Gray. I can't wait to see how she takes on the Titanic! Interesting combo, but I'm curious to see how she'll make it play out! Thanks for the giveaway, this one sounds awesome! I love the letters. I have to say I must read this. I love all things that have to do with the Titanic and this will be no exception! Thanks for the blurb. Are these letters real? Like some of the real letters from the titanic? Is this book fiction or does it actually contain real letters from the titanic?